The BN.com book gods have a special offer for you! THE GLASS WIVES is a BAHGAN in paperback at $4.48 just in time for the beach, the pool, the plane, and all you early-bird Christmas shoppers! Ho! Ho! Ho! You can order it and have it delivered or order it to pick up at your local BN. In that instance you can also get a snack. 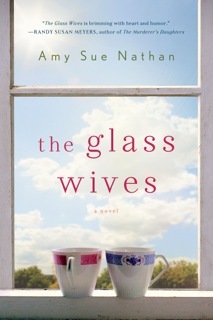 Well, I ordered The Glass Wives immediatedly after reading Amy’s post about the B&N $4.48 price, only to be told this a.m. It’s been delayed!!! So much for my Beach read, but it’s raining here anyway! As my grandma always said, Anything worth having is worth waiting for.